Verifying NFPA hyperbaric chamber ground requirements for grounding of hyperbaric chambers and grounding of patients within these chambers has traditionally been complex and cumbersome. Either healthcare facilities were faced with the do-it-yourself procedure of buying and assembling wires, connectors, multimeters, and testers or they had to purchase ready-made ground-checks that cluttered the floor under the chambers or had to be moved from chamber to chamber for testing. Now there is a better solution — the first fully integrated Ground-Check System from Sechrist. 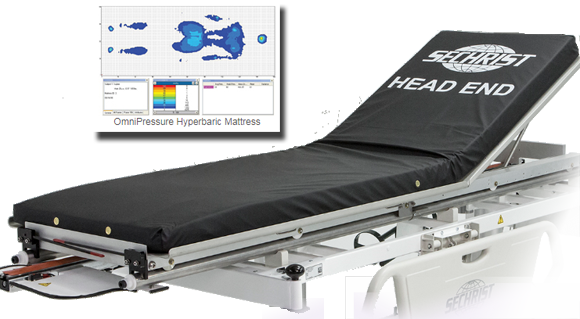 Integrated into the chamber itself, the Sechrist Hyperbaric Chamber Ground-Check System not only tests the patient and chamber independently for ground integrity, but this system also tests the ground integrity of the complete patient grounding pathway (ground stud, chamber and patient). Testing the complete patient grounding pathway to meet NFPA 77 provides a higher level of confidence and assurance in a facility’s safety checks. The Sechrist Ground-Check Kit provides equipment to verify all hyperbaric chamber ground NFPA 99 and 77 requirements. It comes pre-integrated in all Sechrist Hyperbaric Chambers or can be purchased as a fieldupgrade kit for chambers already installed. The Sechrist Kit is not only cost effective, it enhances efficiency and improves safety.